. In plants, these proteins are held inside organelles called chloroplasts, while in bacteria they are embedded in the plasma membrane. Some of the light energy gathered by chlorophylls is stored in the form of adenosine triphosphate (ATP). The rest of the energy is used to remove electrons from a substance such as water. These electrons are then used in the reactions that turn carbon dioxide into organic compounds. 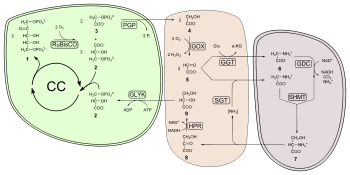 In plants, algae and cyanobacteria, this is done by a sequence of reactions called the Calvin cycle, but different sets of reactions are found in some bacteria, such as the reverse Krebs cycle in Chlorobium. Many photosynthetic organisms have adaptations that concentrate or store carbon dioxide. This helps reduce a wasteful process called photorespiration that can consume part of the sugar produced during photosynthesis. Schematic of photosynthesis in plants The first photosynthetic organisms probably evolved about 3,500 million years ago, early in the evolutionary history of life, when all forms of life on Earth were microorganisms and the atmosphere had much more carbon dioxide. They most likely used hydrogen or hydrogen sulfide as sources of electrons, rather than water. Cyanobacteria appeared later, around 3,000 million years ago, and drastically changed the Earth when they began to oxygenate the atmosphere, beginning about 2,400 million years ago. This new atmosphere allowed the evolution of complex life such as protists. Eventually, no later than a billion years ago, one of these protists formed a symbiotic relationship with a cyanobacterium, producing the ancestor of many plants and algae. The chloroplasts in modern plants are the descendants of these ancient symbiotic cyanobacteria.